Located in Las Vegas and serving customers throughout Henderson, Summerlin, and Boulder City, Flatliners Pest Control has the expertise to handle your spider infestation problems with ease. Our team will help you assess and eliminate any spiders that have invaded your home or business. Let us get rid of these troublesome insects before they cause a danger to your family’s health. What Spiders Are In Las Vegas? While the majority of spiders in Las Vegas don’t survive for long inside homes, there are still some species that thrive in indoor areas. Many of them are known to bite and can release a toxic venom. When you need a pest control expert familiar with spiders, we are the one company to call. Unfortunately, Nevada’s most common indoor spiders include some of the larger and more aggressive types. 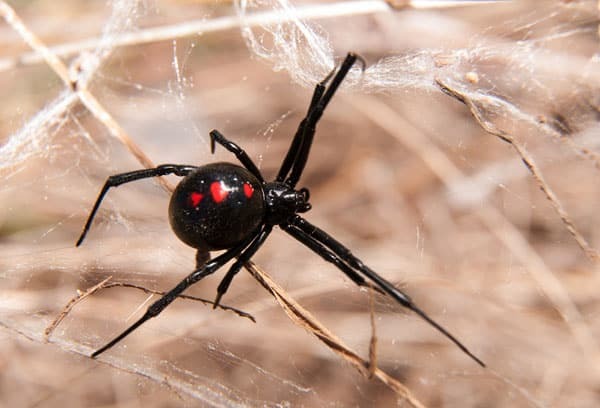 The black widow and brown recluse are extremely dangerous, and you should seek emergency care immediately if bitten. If you see a spider or nest in your home, contact us right away so our knowledgeable technicians can determine what species it is and the best way to eliminate them. The most common spiders breed and build their webs in dark and recluse areas. It’s natural for people to be afraid or cautious around spiders. If your business or home has any spiders at all, we will come up with a solution that works no matter if it’s a massive infestation or just one that needs to go. it’s imperative that the problem is assessed and resolved by an expert exterminator as soon as possible. Our pest management team can remove nests, webs, eggs, and will take preventative measures after the process to keep them out for good. When you choose Flatliners Pest Control, you benefit your health and your property. Our entire product line and removal techniques are safe for pets, children, and the environment. We pride ourselves on keeping your plants, grass, and trees alive. You even have the option of an entirely organic solution. Other companies use harsh chemicals and pesticides that have been linked to allergic reactions and severe long-term health problems. Protect yourself and the environment with our stress-free spider control service in Las Vegas. At Flatliners Pest Control, we take your pest control and spider problem seriously. We believe in doing the job right with integrity, reliability, and not requiring long-term agreements. If you suspect a spider infestation or nest has invaded your property, we’ve got you covered. For a quote or any questions about pest control, give us a call today.